I found this book to be an enjoyable, fun, quick read full of Davidson’s trademark humour. The heroine of the story, Leah Nazir, is an ‘insighter’, a therapist like person who helps others access and deal with their memories of past lives. In Leah’s world the majority of the population can remember living before and sometimes these memories can influence the decisions made in their current life, especially bad habits. At the start of the book Leah is helping her clients in her detached manner while waiting to be murdered…she has the unfortunate fate of being murdered in all of her past lives. The internal thoughts of Leah while ‘helping’ her clients are snarky yet truthful and very amusing to read. The hero of the story, Archer Drake, starts off watching Leah on behalf of a client and ends up being so fascinated by her he has to meet her. He surprises Leah to such an extent that they end up in the hospital….highjinks ensue. As the story and their relationship develop Leah starts to question her fate and confront her past(s). I would recommend this book to anyone wanting a modern romantic fantasy packed with fun and humour. 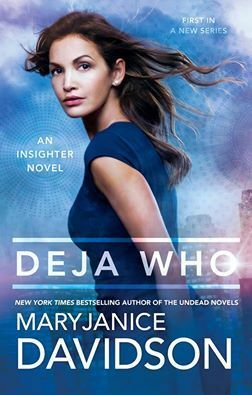 This entry was posted in Book Reviews, Fantasy, Fiction and tagged book review, City of Parramatta Libraries, Deja who, MaryJanice Davidson by admin. Bookmark the permalink.